You may not know it, but the health of the greater Kansas City area depends, in part, on our community health centers (CHCs), also sometimes referred to as federally-qualified health centers (or FQHCs). Be located in a medically underserved area or must serve an under-served population of people. There are many other criteria, as well. These requirements are designed to ensure that community health centers are working with the community, not just serving or servicing the area, in order to make basic health care accessible and affordable. CHCs are nonprofit, public benefit corporations and as such, they are transparent. They publicly report how they use funds, and on utilization and quality measures. 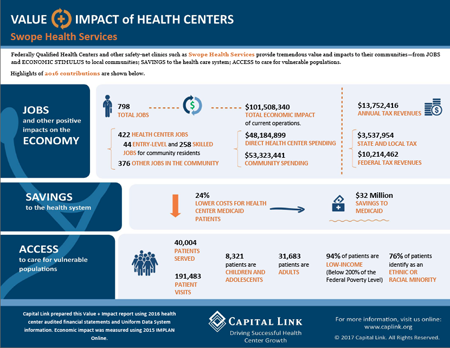 Additionally, community health centers are powerful economic contributors to the areas where they operate. In the Kansas City, Missouri, area, the three predominant CHCs (KC CARE Health Center, Samuel U. Rodgers Community Health Center, and Swope Health Services) are responsible for the existence of 1,405 local jobs – many of which are filled by highly-skilled medical professionals who live in our neighborhoods. By providing lower costs for Medicaid patients, Kansas City’s community health centers saved Missouri’s Medicaid program (MO HealthNet) $61 million in the year 2016. Also in 2016, these three CHCs paid more than $23 million in local, state, and federal taxes, which help support other public infrastructure. These three centers served more than 70,000 individual patients in Kansas City and recorded nearly 300,000 office visits in 2016. Statewide, Missouri’s 29 community health centers served more than 500,000 patients in 2016, with approximately 2 million office visits, generating a total economic impact of more than $1.4 billion and employing more than 9,000 people with full-time jobs. 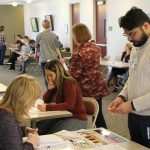 The Missouri Primary Care Association helps Missouri’s health centers identify and respond to the biggest obstacles facing Missouri’s communities and patients, and to create programs to address them. Together, Missouri’s CHCs are leading the way, in collaboration with local, statewide, and national partners, to better health and stronger communities through health education, preventive health care, and chronic-condition management that will guarantee lasting and meaningful change for many generations of people, not just in Kansas City, but throughout our state. So great to have these centers in Kansas City! 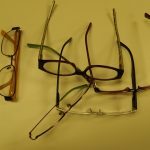 I’d love to know more about if there are currently any occupational therapists working in these facilities, and if there are, how are they being utilized? OTs can meet a lot of needs in these setting through mental health, community health, and primary heath interventions in addition to traditional rehabilitation services.